Our team of Chefs have been busy developing exciting new dishes for our Winter Menus. The new dishes, appearing as Daily Specials over the last few weeks, have well and truly received the 'thumbs up' from our guests. Fantastic - all systems go! 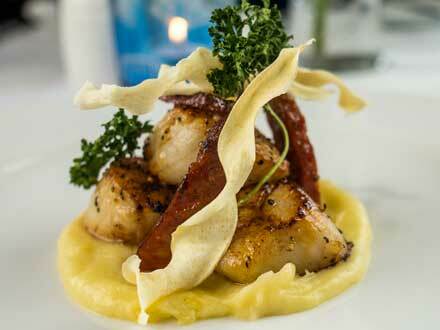 Pan seared West Coast scallops (image above) with creamy parsnip purée, warm chorizo and parsley crisps. A winter delight - starring sweet, rich, creamy parsnip, contrasted with spicy Spanish dried sausage and a satisfying crunchy crisp. Crispy Scottish Clava Brie cheese served with fresh fig, candied walnuts, rocket salad and balsamic glaze. A simple dish by design - fresh fruit, nuts and leaves are all this delicious Brie needs. Loch Fyne Gin infused Smoked Salmon served with roasted pickled beetroots, croutons and herb soft cheese. A delicious combination with a touch of botanical flavours, a very lightly pickled beetroot and delicate dill soft cheese. A light, fresh start to your meal. Macsween Haggis Bonbons served with turnip purée, winter leaf salad and whisky dressing. Using the finest of ingredients, a warming winter dish with an explosion of flavour in every mouthful. Oven roasted fillet of Salmon with a creamy langoustine mashed potato, steamed broccoli and a lemon butter sauce. What makes this salmon dish sing is the depth of flavour from adding langoustine tail meat and bisque to the mash and the silky smooth, fresh tasting sauce. Delicious. Pan fried Ricotta and Parmesan Gnocchi served with butternut squash purée, crispy sage and pine nut with a herb dressing. A beautifully crafted dish of contrasting tastes and textures - sweet and salty, crispy and smooth. 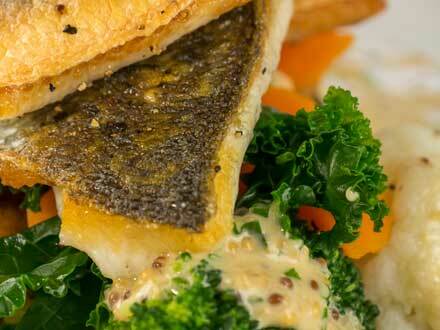 Pan seared fillet of Sea Bass served with a potato crab cake, cauliflower purée, winter vegetables and wholegrain mustard sauce. Firm white fish with a crispy skin, delicious white meat crab cake and a wonderfully sharp contrasting mustard sauce. 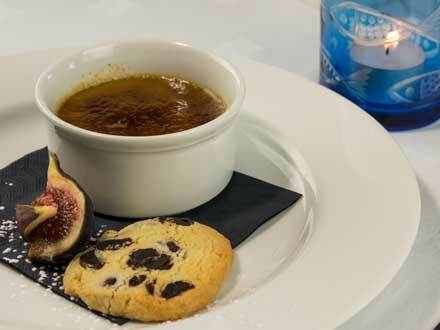 Espresso Crème Brûlée served with chocolate chip shortbread. A different take on a favourite dessert. It's light, creamy, not too sweet with the coffee flavouring and, of course, yields to the essential 'crack' of the spoon. Perfectly accompanied by the Chef-made shortbread.